Icebug Acceleritas 6 RB9X has just been released by Icebug. Our experts are working on a detailed review. Please, come back later. When RunRepeat asked me to review the Icebug Acceleritas 6 RB9X I got quite excited. Looking at the specs they "ticked all right boxes": well-ventilated, low stack and drop, grippy, and very light. 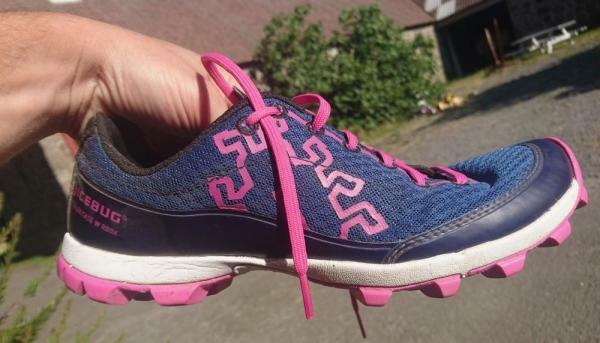 Exactly what I look for in a trail shoe. Was this finally the "grippy lightweighter" to replace my aging Inov-8 X-talon 212 standard fit? My only worry was the narrow last! As a recreational ultra-runner, I'm quite adamant when it comes to comfort. How would my feet and body cope with the rather narrow Acceleritas 6? Upon opening the box my immediate thought was "Nice!". The Acceleritas 6 has a classical yet rather distinct look. They make up a well-designed and light-looking unit. Nimble and sophisticated. I would normally not consider "a pink shoe" - more or less willingly accepting the general gender/ color preconception. But somehow pink fit these shoes well. They do not look overly gender-specific - despite being marketed as a women's model. Anyway, if pink "is not your color" there is always the so-called men's model. It is identical except it sports a more neutral "orange neon"-ish color instead of pink, and it also comes in larger sizes. The Acceleritas 6 is true to size lengthwise. They both look and feel rather narrow laterally. However, they are very flexible, and accommodates a wider foot by "stretching". Well, not truly stretching - rather "flatten out" to become wider at the cost of space over the instep, and the foot getting outside the midsole horizontally. The narrow and flexible last offers excellent control in technical situations, and a superb feel for the trail - low stack and no rockplate. I'm normally a wuss when it comes to ankle injuries, but I never once feared twisting my ankles while running in the Acceleritas 6. Even when "going full throttle" on difficult technical/rocky trails, something I otherwise rarely do. The low stack and narrow last, however, offer very little support. For me this effect kicked in when going for longer runs - an hour was my maximum. After that, the reduced support of the Acceleritas 6 became an issue for me. My feet "felt tired" and this soon spread to my ankles and calves. At first, I put it down as "they need a bit more breaking in". But after the first three back-to-back runs (a bit more than an hour each) I started getting stabs of pain along the outwards lateral side of my right foot. I ended up having to take a break from the Acceleritas 6 for fear of injuring myself. Please note that this is not a case of me not being used to minimalistic, zero drop, low stack shoes. I have several pairs of shoes in that category and use them all on a regular basis. It was rather a case of too narrow, too much, and too soon. After a few runs in some other shoes, I was able to come back to the Acceleritas for some more testing. One short run at a time though - no more hour-long back-to-back runs. As another measure to overcome the tightness, I decided to see what would happen if I removed the insole. Heureka! That was a completely different experience. Suddenly the Acceleritas 6 felt if not roomy then at least not foot-squashing anymore. With the insole removed, the already excellent feel for the track was even more pronounced. Removing the insole had, however, no positive effect on the lack of support. The upper is made from a nice, soft, open-weave fabric. It feels reasonably sturdy, and I haven't been able to damage it during the review period. It is well-ventilated and fine for summer runs. I doubt it would provide much protection come winter and snow, though - but only time will tell. The Acceleritas (this is the sixth iteration) has been praised for their drainage capacity, see e.g. balkanrunner.com. It is also one of the selling points on the Icebug website, e.g. suitable for swim-runs. Hence, on one of my first runs (coincidentally along the beach), I decided to test this by venturing into the Baltic Sea (nice on a hot summer day). Quite right - water gets in quickly and water gets out - little is absorbed by the shoe. The moisture in the sock is another matter. Normally when your foot strikes the trail, the pressure inside the shoe pushes/squeezes water out of the sock/shoe. With each step away from the moisture source, your shoe/socks get just a tiny bit less wet until some rather damp equilibrium is achieved. This does not seem to happen much in the Acceleritas 6. I'm not sure why. I speculate that it may be due to the plasticky band that runs the entire circumference of the Acceleritas 6. In effect working as a very short "gumboot". I don't know. All I know is that my socks seemed to retain more moisture and longer than usual. The tongue is made from a rather thin, leathery material with some internal foam-like cushioning in the central parts. The material is a bit glossy and to some extent water repellent. It is only attached to the shoe at the lower end with the usual lace-hole half-way up. The tongue is sufficiently long and its easy to grip when putting on the shoe, and it does not move around when running. Overall nice, soft, comfortable and accommodating to the foot. What I don't get is a series of holes towards the lower end of the tongue. Three to four mm in diameter and facing upwards. I presume they are there to provide extra drainage and/or ventilation?! But what good are drainage holes facing upwards?! To my knowledge, water takes a distinct dislike to flow up! Even should the holes have a positive effect on drainage, it is clearly outweighed by their tendency to funnel stuff into the shoe (being located right at the instep notch). On my first run on the beach, they filled up completely with sand. On my second run - not on the beach - I had to stop twice in 12 km to empty small piles of fine gravel from my shoes, and that despite wearing gaiters. That is, in my opinion, a major design flaw in a trail shoe. Okay, OCR runs are generally not very long and you are covered in mud, water and "other stuff" for most of the run anyway - so who cares about a bit of grit in the shoes. Well, I do - I hate blisters and tiny stones are a prime source of blisters! After three runs I grabbed for a role of duck-tape, and that was the end of those holes. Icebug - if you read this! Get rid of those tongue holes! They are a nuisance. If you want more drainage I suggest you put in a series of sieve-like holes in that plasticky band that covers the lower part of the upper. Just like the ones on the side of the upper - covered by fabric. That way water may get out, and "stuff" not get in! I like very much that the ankle collar sits very low. To prevent heel slippage Icebug has used a so-called "micro suede" on the inside of the heel cup. This provides extra contact between the shoe and the sock and ensures that the shoe stays on your foot despite the low collar. It also seems a lot more durable than the usual soft/foam like materials used in other shoes. I have seen various similar "shark-skin" features in other brands, but never tried it. Conceptually it seems very useful. You easily slide in your foot, and you sure feel the "grip" on the sock when you try to pull out your foot. The shoe/sock locks down nicely so to speak, without having to over-tighten the laces. However, after trying it I'm not entirely convinced that micro-suede is such a great idea after all. Somewhere along the gait cycle your foot/ankle will unavoidably move relative to the shoe. By decreasing the motion-opportunities in the sock/shoe zone you inadvertently increase the amount of motion going into the skin/sock zone => Blisters! And damn right ... the Acceleritas 6 is the first running shoe in many years to cause me blisters on my Achilles. Right at the point of the micro-suede - on both legs! This may be an entirely personal issue or a "wrong-usage" issue - I don't know. All I know is that I hate blisters with a vengeance and normally never get them! After a period of painful trial-and-error, I finally dialed in a way to wear the Accelleritas 6 that worked for me. Put on a rather thick sock (Thorlo Experia), take out the insole, and employ the lace lockdown technique. That allowed me to go for 10-12 km runs without any blisters. The outsole is made from the outstanding Icebug RB9X rubber and has very grippy 8 mm lugs positioned in an effective mud-buildup-preventing configuration. They provide superb grip on anything I have thrown at them. You will not be disappointed - trust me. The grip is simply as good as it gets in an unstudded trail shoe! And that says quite a lot coming from an avid X-talon fan! Outsole: Pink, aggressive-looking and very grippy! Right out of the box, the pair I tested - a womens UK 6.5, EU 40.5 - weighed in at 394 grams. That is 197 grams each. Without the insole, they were 376 grams or 188 grams each. Rather impressive! It is hard to find trail shoes lighter than this - especially with such an aggressive outsole. On my second run, I set a personal best on one of my regular rather technical routes. Twelve kilometers of gnarly, winding, rocky single-track with the odd puddle and stream crossing. The Acceleritas 6 is simply the fastest, lightest and most grippy trail shoe I have ever tried! Pure joy! Through my testing, I have found that thanks to the grip, control, and ground feel, they are suitable for almost any type of trail - muddy, rocky, hard, soft, and sandy (minus the tongue holes). They do it all, and they do it fast and well! Even the odd bit of road they handle reasonably well - though I wouldn't recommend going for longer runs on asphalt. There were no sudden defects or build issues for the first 50+ miles. There was hardly any wear to speak of on the upper. The outsole, however, showed a rather worrying amount of wear on the lugs considering the mileage. The lugs have clearly "grated off" and become rounded, and with the lugs goes the grip. I worry that the outsole will not last long and the shoes soon have an uneven outsole and are useless. Despite the narrowness, annoying tongue-holes and initially blister-causing micro-suede, I really like running in the Acceleritas 6. They are speedy, lightweight and nimble, and the grip is outstanding. I wish they could become my "go-to" trail shoe - even with duck-taped tongue-drainage-holes. However, after 50+ miles I am calling it quits. They are not suitable for my kind of running (slow and long), mainly because of the lack of comfort. I am always on the lookout for comfortable, light trail shoes with a solid grip. Over the years I have tried several Acceleritas-type shoes. I can't help asking: "Why do lightweight trail shoes with extreme grip have to be so bloody narrow and uncomfortable?" For example VJ Sport Irock, Inov-8 X-talon Precision fit, and now the Icebug Acceleritas. All super shoes - but too bloody uncomfortable for anything more than sprints. The Acceleritas 6 is a phenomenal shoe - but very specifically targeted towards short and extreme conditions. That's all good if you regularly find yourself in a race-like situation and need the lightness and grip (e.g. OCR). But if you are a bit more like "average me" and only do the odd race, it seems a bit over the top to spend the equivalent of 130 euros on a shoe that may not see much mileage outside of race-time. The Icebug Acceleritas 6 is a very light, extremely fast shoe. It offers an awesome grip, superb control, and a wonderful ground feel. It is - but for a few flaws - well suited for short, technical trail races and OCR type runs. If you are a keen and fast obstacle-course racer and your feet are somewhat narrow I strongly suggest you try the Acceleritas 6. The Acceleritas 6 is, however, also very narrow, provide very little support and do not seem very durable! They have a very narrow and specific usage spectrum, and is not a shoe for the "average running Joe". Certainly, don't expect to take them out for your next ultra or use them as your everyday trainer. I am an independent recreational runner, and not in anyway affiliated with or paid by Icebug for this review. It represents my personal thoughts and experience with the Icebug Acceleritas 6. The shoes were provided to me free of charge by runrepeat.com for whom this review is written. The Icebug Acceleritas 6 is a trail running shoe that I have been eyeing for quite some time now due to their popularity and reputation for having exceptional grip. Well as luck would have it, I was able to finally test this shoe out and see if it lives up to the hype. I was skeptical at first due to the shoe having been described as narrow, but was eager to see for myself. So here is what my wide-footed self-thought of the Acceleritas 6. What the Acceleritas 6 is primarily known for is it phenomenal grip, which does, in fact, live up to that hype. The lugs on the shoe come from tractor tires, which descend into the ground and push it aside instead of just grabbing the top layer. The lugs of the shoe are 8mm and are comprised of Icebug’s Extreme Rubber Compound Development, or RB9X, and have grip for days. Whatever the terrain, the Acceleritas can thrive in it. I do, however, worry that because the lugs are so aggressive, they will begin to wear down more quickly than most shoes. The Acceleritas 6 has a very narrow fit, but do run true to size. When I first put the shoe on, I immediately felt that a break in period was required. However, even after 50+ miles, I never felt that they were fully broken in. While running in these shoes for over an hour, my mid-foot and toes would begin to hurt and I felt I needed to stop or risk injury. The shoe feels comfortable when first putting on, however, I was disappointed that the comfort did not last throughout my run. I thought taking the insole out of the shoe might help my discomfort issues, but sadly it did not. Even using my custom insoles that are designed for my specific foot did not improve the issue. The heel cup of the shoe does offer a very wide fit with easy access for your foot to enter the shoe. The heel cup is thin, but seems to be very durable and offers sufficient ankle support. It did not put a lot of strain on my Achilles, which I have recently had issues with. On almost all of my runs, I began to get blisters on the back of my ankle and spent several runs brainstorming the best way to stop this. I finally settled on taking the insole out of the shoe, wearing two pairs of long socks, and putting Body Glide around my ankle tendon, which helped tremendously. However, it is disappointing that I had to go to such lengths to run comfortably. The shoe tongue on the Acceleritas 6 is very thin and moves to the side while running. This tongue does not offer great protection when it comes to keeping debris out. My main issue with the tongue of the shoe is the 3-4mm holes beginning in the middle of the tongue and ending at the end of the tongue. I do not understand why the holes are there because they do not help with drainage and allow for debris and sand to enter easily. At the end of all my runs, the shoe is filled with sand and I can only conclude that the holes are to blame. I wish it were possible to replace the shoe tongue because this would help the shoe tremendously. The insole of the shoe is very thin and I recommend not using it. I would suggest using this shoe with either a custom insole or none at all. Seriously, Icebug could have put a little more work into the design of this insole. The toe box of this shoe does offer a wide display upon first inserting my foot into the shoe. However, after 30 minutes or so into my first run, the top of my toes began to blister due to rubbing against the beginning of the shoe tongue. This issue is still prevalent after 50+ miles of running in them however it has improved slightly with time. I have run over 50+ miles in these shoes, yet they do not show much sign of wear. I do worry that the lugs will wear down quicker than most shoes due to the lugs being bigger than most, however so far there are no obvious signs of damage. The Acceleritas 6 has the potential to be a phenomenal trail shoe, however, it has not agreed with my foot due to the shoe being primarily narrow. If your feet happen to be on the narrow side, I would recommend using this shoe for short distance trail runs or short obstacle course races, due to its minimal padding and support. If you have a narrow foot then I highly recommend you try this shoe, just be aware that a break in period will most likely be required. The Icebug Acceleritas 6 is a shoe that offers phenomenal grip and is extremely lightweight, however, there are some design flaws. After running over 50+ miles in this shoe, I have decided to discontinue training in them, although, I will keep an open mind about using them for specific races in the future. For me, this shoe was too narrow and did not offer much comfort. On almost every run over 3 miles, the discomfort would become nearly unbearable. I believe most of these issues were due to the width of my feet in this, particularly narrow shoe. I would recommend this shoe if you have a narrow foot and plan to use this shoe for short distance obstacle course races. The Icebug Acceleritas 6 is a shoe purpose-built for runners looking to tackle difficult terrain both on and off-trail. It is a minimalist shoe at its core. It is low, it is light, it is fast. Unfortunately, it also fails to reach its potential. As you continue to read, you will come across 3 sections: Why?, Why Not?, and Conclusions. My review will focus on the reasons the shoe could work for you (Why? ), what may not work for you (Why Not? ), and some final thoughts (Conclusions). The Icebug Acceleritas 6 comes in at about 8.8oz or 250 g for my size 11.5. This is great for a trail shoe of this size. This provides a nimble ride and the shoes can be turned over easily on downhills and technical terrain. I really enjoy wearing shoes that have some flexibility. This shoe's minimalist design gives it plenty of flexibility throughout. This allows for the shoe to be versatile on different terrains and at different paces. The Icebug Acceleritas 6 seems to almost mold itself to the terrain which provides extra grip. The lugs on this shoes have plenty of space between them. This is great for the muddy and wet terrain. The Icebug Acceleritas 6 can grip in muddy terrain and shed the mud. The extra space makes sure the mud doesn't clump and get stuck between the lugs. The lugs gripped well on most surfaces and conditions. Rocks, roots, mud, dirt they handle with ease. The only concern is they struggled to grip wet rocks. This shoes can handle water, creek, and river crossing. They drain extremely quickly. Maybe the best of any trail shoe I've ever had. Ice does market them for swim runs, now I can see why. I really enjoyed wearing these with my kids during one of their favorite past times, exploring streams and creeks. They drained so quick it was as if I was wearing sandals. Quite remarkable. Because they drain so quickly, they have a breathable upper. This kept my feet cooler than most shoes even in the summer months. The Icebug Acceleritas 6 is constructed well for how light it is. Many bands simply put lighter less durable materials on their shoes to cut weight. This is not the case with Icebug. There is extra stitching near high wear areas, even the toe cap is stitched in place. The rubber outsole is showing no signs of wear currently. I have to give major kudos to Icebug for quality construction on a lightweight shoe. For me, versatility is one of the most important characteristics of a running shoe. Unfortunately, the Icebug Acceleritas 6 is one of the least versatile shoes I've ever worn. For example, when running on paved surfaces or even dry packed dirt these shoes were almost unwearable. Anyone who has run across a parking lot or a sidewalk wearing cleats for sports like football, soccer, lacrosse, etc. could relate to this experience; because this is exactly how the Icebug Acceleritas 6 feel on hard surfaces. When running on paved surfaces you can feel every lug on every footfall. If you have a couple of miles to run to get to your nearest trail, or a mile of gravel road before the single track trail starts, these shoes would be almost unbearable. In addition, these shoes seem pretty purpose built for short distances running. The longest run I attempted in these shoes was 15 miles, the run featured three 5 mile loops. After loop 2 I had to stop and change shoes. There was no particular hot-stop or problem area, just general foot fatigue. Lack of cushioning? Not much underfoot protection? I'm not sure. They were just on incredibly uncomfortable after more than an hour on the trail. The Icebug Acceleritas 6 has a pretty good outsole. It's grippy, can handle a variety of terrain, sheds mud well, but it lacks any protection for rocks or sharp roots. The outsole has a gap (see picture below) in the lugs between the forefoot and heel. If you step on any sharp rock or root and it lands in the middle of your foot, it's going to hurt. I got several bruises on the bottom of my foot while wearing these. I have only experienced this before when wearing road flats on trail runs. These are the least protective trail shoes I have ever worn. When running on trails, especially on hilly or technical terrain, I don't want to have to think about every foot placement. I just want to run. However, due to the lack of protection, the Icebug Acceleritas 6 hardly inspire confidence. I am a true size 11.5 and the Icebug Acceleritas 6 in an 11.5 are just too tight. The length seemed spot on, but they are really narrow through the toe box and mid-foot. However, that tightness did not continue to the heel. The heel had a sloppy fit, which I have yet to figure out. If I lace them up tight they pitch my Achilles and when loosened up there is some heel slip. I don't think sizing up is the answer, as the sloppy fit in the heel would just get worse. The Icebug Acceleritas 6 shoes have some potential to be top notch light trail runners. But currently, it is just potential. The lightweight and nimble feel are great. However, the Icebug Acceleritas 6 is unwearable on some on my local trails. I'm not willing to leave the trails with bruised feet. I can see these being great shoes for those who enjoy running at quicker paces on wet and muddy trails, or for obstacle course racing. 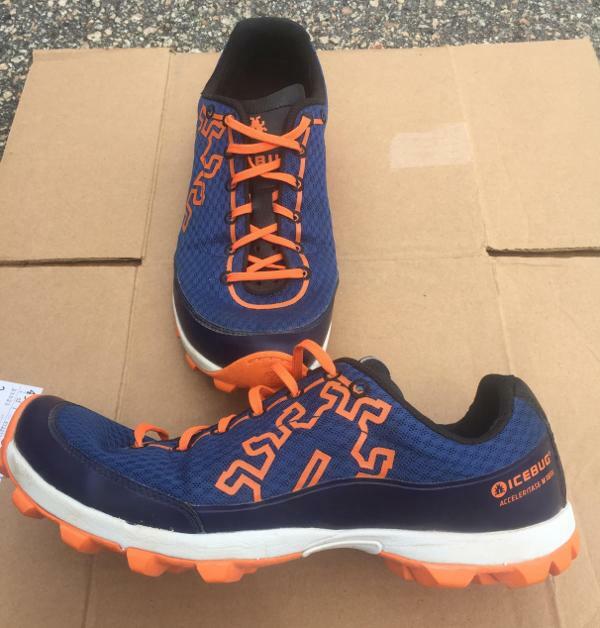 The Icebug Acceleritas 6 lacks versatility and it seems fit/sizing was an afterthought. With a few teaks, these shoes would get a much higher score. A little more underfoot protection and a dialed in fit would go a long way. The Icebug Acceleritas 6 RB9X is a trail running shoe that is crafted for those who want to excel in different running activities. It features the Polyester bluesign mesh upper. This updated material is airy and soft. Because of its lightweight structure, the user will feel like barefooted during the run. The Icebug Acceleritas 6 RB9X also improved its midfoot pattern. Its design aims to enhance the fit for a better running experience further; it is ideal for neutral pronators. A slightly reduced height of the heel cup is also an added feature of the shoe. This material aims to lessen the force in the Achilles tendon. The Icebug Acceleritas 6 RB9X uses the standard measurements when it comes to size. It is sure to follow the usual preferences of users. The available widths are B- Medium for the women and D – Medium for the men. The heel and forefoot area of the Icebug Acceleritas 6 RB9X features the RB9X. This material is also known as the Rubber 9 Extreme. With the utilization of this material, durable traction is offered in a wide variety of terrains. The shoe is sure to on hold onto hard and soft surfaces. As a result, users will be able to finish their running activities with ease and confidence. The Rubber 9 Extreme aims to provide excellent grip on both wet and dry surfaces without sacrificing the platform's durability. A compression molded lightweight foam, or EVA is integrated into the midsole of the Icebug Acceleritas 6 RB9X. The midsole is described to be very flexible and has a low-drop. The primary purpose of this material is to keep the foot comfortable even when tackling uneven and challenging surfaces. The EVA racing sockliner is utilized in the footwear. This component of the shoe is glued to the insole to provide additional comfort throughout the runs. The Bluesign Polyester mesh covers the upper section of the Icebug Acceleritas 6 RB9X. With the utilization of this material, the platform remains to be lightweight and breathable in both wet and dry conditions. The quick-drying Bluesign mesh is integrated into the footwear. This lining is significant in keeping the foot fresh, cool and dry throughout the running activity. A slightly reduced heel cup is utilized in the shoe. The main focus of this material is to lessen the pressure in the Achilles tendon. It is essential in holding the foot in place to prevent accidental shoe removal. As a result, a more agreeable and comfortable ride is created.